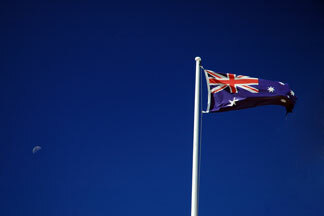 The Union Jack in the upper left-hand corner of the Australian flag serves as a reminder that the continent of Australia, which was unified in 1901, was originally a commonwealth of six British subject states that were formerly separate. 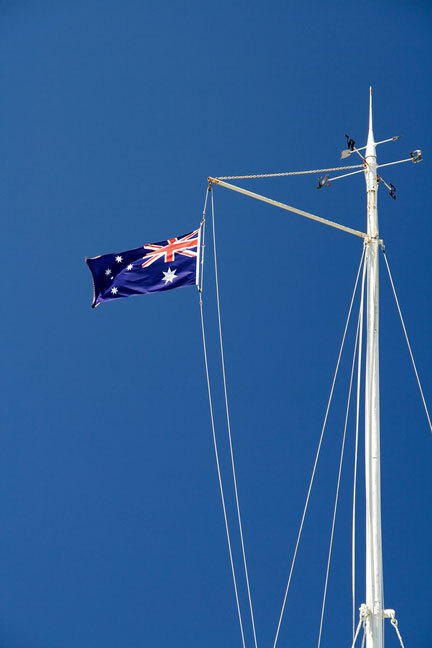 Australia's flag was the result of a design competition; the flag was adopted in 1906, though with limited use. 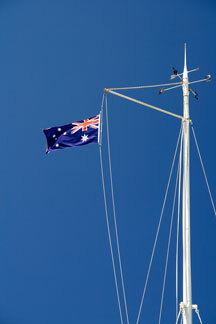 The background of the flag is blue, while the foreground includes three elements that are important to Australia's statehood. 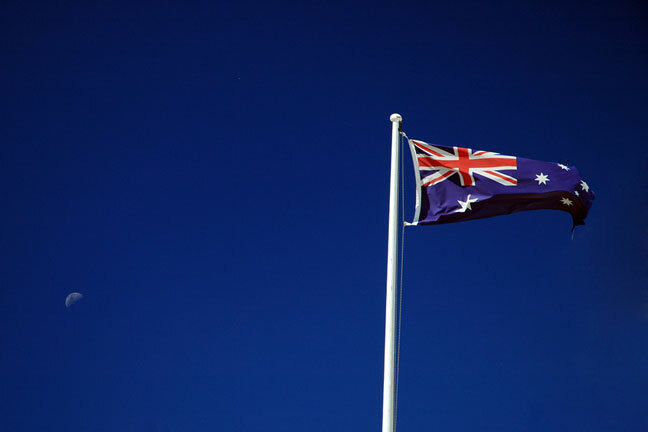 The stars of the Southern Cross appear on the right-hand side of the flag. This constellation, an important navigation aid, is honored on the flag because it helped early settlers reach the new continent. Great Britain's Union Jack flag occupies the upper hoist corner, or canton, of the flag. 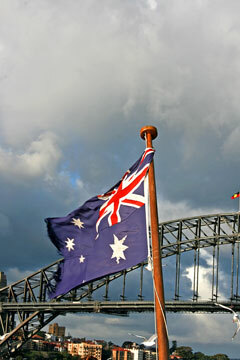 This element signifies the historical ties between Australia and Great Britain. Directly under the Union Jack is the Commonwealth Star. While there were originally six points on the star to signify six federal states, another point was added in 1909 to represent the Northern Territory. The country of Australia is slightly smaller than the United States, and it occupies about 7,686,850 square kilometers — about 62,920 square kilometers are water — in Oceania. The country comprises the continent between the Indian and South Pacific Oceans, as well as thousands of islands of various sizes. The western two-thirds of Australia is made up of plateaus with areas of desert, while the east-central region is made up of lowland plains that rise into a highland belt along the East Coast. These maps of Australia show Australia's Southern Hemisphere location as well as its major cities, highways, and geographical features. Australia has a subtropical arid climate, with hot, humid, and rainy summers and dry, warm winters in the north and dry and sunny summers and mild and rainy winters in the south. Australia also has the distinction of being the world's driest inhabited continent; there are few bodies of water in Australia or rivers that flow through it. Rainfall in Australia is fairly minimal, except on the eastern coast. The earliest inhabitants of Australia were nomadic hunter-gatherers and fire-stick farmers known as aborigines, who arrived in Australia thousands of years ago. The first European settlement in Australia was in the late 1700s, when the British moved about 160,000 convicted prisoners to the country. While the penal colonies lasted for approximately 60 years, individual immigrants began to come to Australia in 1820. The amount of available land, and the fact that gold was discovered, brought even more immigrants to Australia during the mid-19th century. While wheat, gold, wool, and beef and dairy were popular industries in early Australia, today the country relies upon wool, beef, dairy, steel, and manufacturing. Today, Australia's population is highly multicultural, with about one in four Australians being born somewhere other than Australia. Following World War II, Australia aligned its foreign policy to the United States rather than Great Britain; in 2005, the country entered into a bilateral free-trade agreement with the United States. Australia also has a close relationship with China. The capital of Australia is Canberra, while its largest cities, in order of size, are Sydney, Melbourne, Brisbane, and Canberra. The island of Tasmania is Australia's largest and most well-known island. 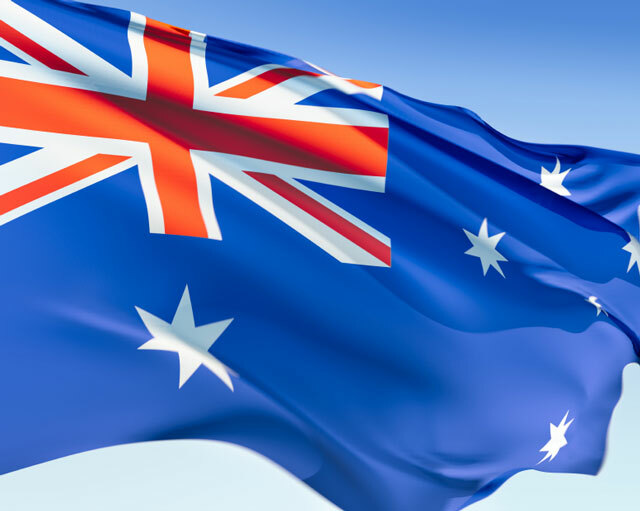 Australia Facts - information about Australia and its flag. Government of Australia - official Australian government website. Australia Map - Australia maps, geography, and tourism. Australia News - news articles and facts about Australia.